I’ve spent a considerable amount of time during the last year tearing apart my Deering/Vega long-neck and then putting it back together. To the dismay of my long suffering spouse, my kitchen table has been turned into a workbench covered with a variety of banjo heads, tailpieces, bridges, strings and the ungodly amount of instrument repair tools I've collected over the last thirty years. What precipitated this intrusion into our otherwise simple lifestyles was a simple modification to two of my banjos: frailing scoops. 1. What type of tone do I need from my banjo? Do I want a dark, tubby, resonate tone? A plunky sound? Or maybe a bright sound that could cut through a noisy jam? The Answer? My Vega long-neck needed to be versatile enough to function at a contra dance, a Blue Sage Band concert, or a solo performance. In a pinch it might even need to function as a bluegrass banjo! For this, I decided to shoot for a defined, somewhat plunky sound that was strong in the med-range frequencies. 2. How much volume do I want my banjo to produce under normal playing conditions? I know that an instrument that is too loud can cause me to "hold back" with my right hand, which will result in thin tone and a loss of accuracy with my right hand. A quiet instrument can cause me to play too aggressively, resulting in almost the same problems as a loud instrument; my tone and right hand accuracy suffer. The Answer? I need a relatively quiet banjo, so I toned down my banjo to the point where it wouldn't drown out my voice when playing in an all acoustic setting. For jams, I use a modified finger pick for extra volume. 3. How high do I need to set the action (string height)? Too low and I'll get string buzzing unless I play everything with a very light right hand touch (which would hurt my tone, accuracy, and volume). Too high of an action and I won't be able to play comfortably above the fifth fret, and I need the whole fingerboard for my style of play. Changing out the head produced the single greatest change in tone, far more than any other factor. - Remo Frosted - the tone was a little too bright by the time I got the tension up to the point where the bridge didn't sag and the unwanted overtones disappeared. - Remo Renaissance (top picture) - I used one for a couple of years. Nice plunky tone, but not quite what I was looking for, especially when playing up the neck. - Remo and Elite Fiberskyn (bottom picture) - As I compared the Remo Fiberskyn with the Elite, the results were unexpected. The Remo produced some annoying overtones that I didn't encounter with the Elite. Now there is a chance that I might have received a defective head from Remo. I was under the impression that both these heads were probably produced by the same manufacturer and so was expecting the same results. Maybe I was wrong and the heads are made by different manufacturers. I contacted both Remo and Stewart MacDonald and neither company could (would?) confirm or deny my suspicions. 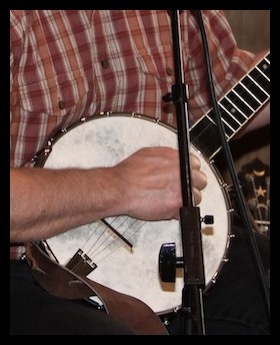 I found that contrary to the advise usually given concerning head tension for clawhammer banjos, I needed to crank the head up TIGHT when using the Fiberskyn or Elite heads. Once tightened sufficiently, the Elite had the best tone, up and down the neck, of all the heads I tried out in this trial. Next to changing head types, the most noticeable change in tone was produced by the addition of a frailing scoop. Note that this change in tone was due to a change in playing technique; if my right hand position remained the same, so did my tone! A scoop allows out you to play over the fingerboard which produces a mellower tone. You can see the new scoop in the bottom photo. I tried three different tailpieces: Presto, Waverly, and No-Knot. Of the three, the Waverly was the hands down winner. The Presto muted the instrument too much and the No-Knot was a little too "open" (mushy) sounding. 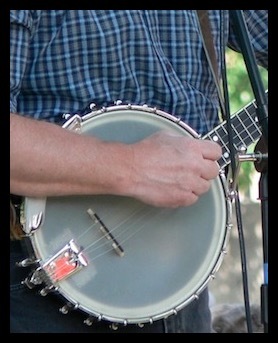 The Waverly, coming somewhere in between the other two in length, was the right choice for this particular banjo. The main tailpiece factors affecting tone are mass, length and tension. The only way I found to control mass and length, was to swap out tailpieces. That left tension as the only variable I could adjust while actually playing, and the only tailpiece that had a mechanism to adjust tension was the Waverly; which might have given it a slight advantage over the other two. Keep in mind that there are other tailpieces available which have the ability to adjust tension and I encourage you to try them out. I should also point out that adjusting tailpiece tension is a great way to fine tune tone; it's the final and most frequently performed adjustment I do when setting up my banjos (if equipped with adjustable tailpieces). It’s surprising how much the longer neck adds to the total weight of my Vega, and that extra mass means too much sustain (at least for me). To combat this sustain, I’ve added “dampeners”; strips torn from an old bath towel (terry cloth ) rolled up and placed between the head and the coordinator rods. By varying the width of the strips, I find I can control the amount of dampening that takes place. In the top photo, you can see the rolled up terry cloth under the tailpiece. When I swapped out the armrest, the change in tone was so minor that I didn’t include it in my list above, but you can see in the photos that I did switch armrests (as well as heads and tailpieces). Although I did swap out my bridges a few times, I stuck with the same builder: Snuffy Smith. Long ago, I tried a multitude of different bridges and found the Smith bridges to be the most consistent. I should point out that Snuffy Smith was good enough to build me a few extremely tall bridges which I used on the thinner heads (thanks!). 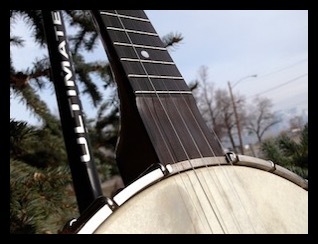 Although I know I’ll be fine tuning the tone of my Vega forever, I’ve now got my banjo sounding close to the goal I set for myself; it’s a good compromise of tone that can work whether I’m playing a dance, a solo show, or even playing bluegrass banjo. Find the tone that is best for your own personal playing style and don't try to set your banjo up using someone else's formula, including mine! Remember that the single biggest factor affecting tone is you!